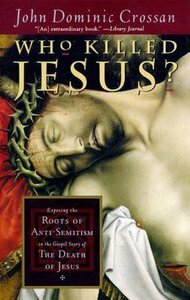 This passionately argued book, written by the bestselling author of The Historical Jesus and Jesus: A Revolutionary Biography, will strike a chord with 'anyone concerned with the rising tide of anti-Semitism in our world, anyone fascinated by the origins of Christianity, and anyone who likes a good mystery' (Susannah Heschel). 'An excellent study'.--Library Journal. - Publisher The death of Jesus is one of the most hotly debated questions in Christianity today. In his massive and highly publicized The Death of the Messiah, Raymond Brown -- while clearly rejecting anti-Semitism -- never questions the essential historicity of the passion stories. Yet it is these stories, in which the Jews decide Jesus' execution, that have fueled centuries of Christian anti-Semitism. John Dominic Crossan, professor emeritus at De Paul University, is widely regarded as one of the foremost historical Jesus scholars of our time. He is the author of several bestselling books, including The Historical Jesus and Jesus: A Revolutionary Biography. He lives in Minneola, Florida.